The second-to-last Delta II rocket lit up the night over California’s Vandenberg Air Force Base in the early hours on Saturday, taking to the skies with the JPSS-1 Weather Satellite for NASA and NOAA, set to become America’s primary meteorological spacecraft in Polar Orbit. 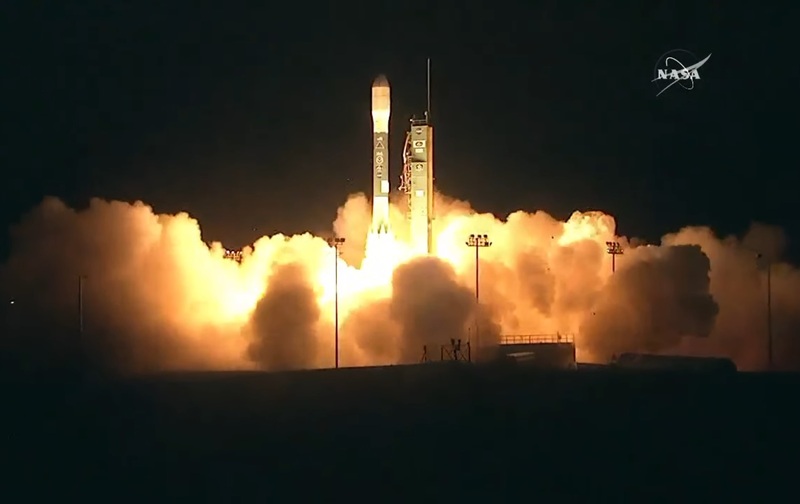 Checking off its 99th consecutive success and 154th overall mission, Delta II successfully placed the 2,540-Kilogram satellite into orbit 57 minutes and 30 seconds after its nighttime blastoff. 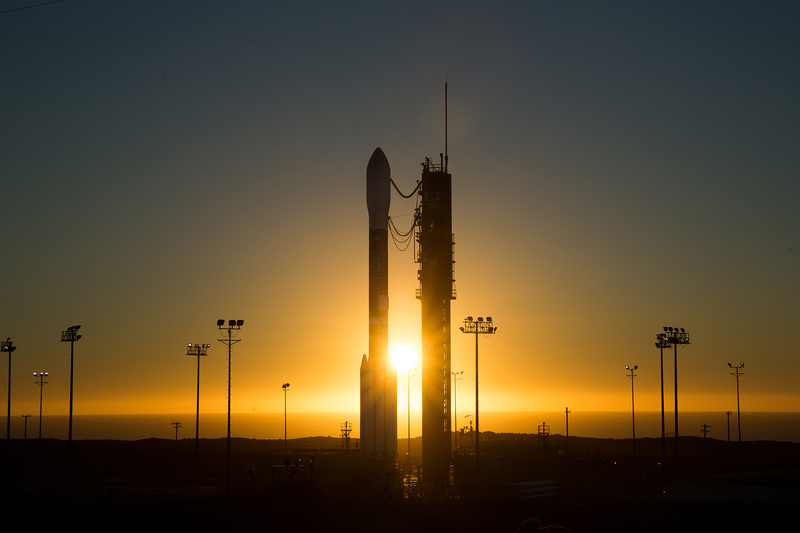 Delta II, counted on for many years by numerous missions to Earth orbit and beyond, is approaching its final flight assignment in 2018 with NASA’s ICESat-II that will close out a career of nearly three decades for the former workhorse of the American space program. Debuting in 1989, Delta II became the most-flown U.S. launch vehicle, lifting government and commercial satellites into Earth orbit and deploying flagship missions for NASA including the Mars Exploration Rovers and the Kepler Exoplanet telescope. The venerable Delta II kept up a remarkable record of 151 successful missions out of 153 launches, encountering one partial failure and one outright failure when a crack in one of the rocket’s boosters caused a spectacular explosion of Delta 241 in 1997 during the rocket’s initial climb-out from Cape Canaveral. 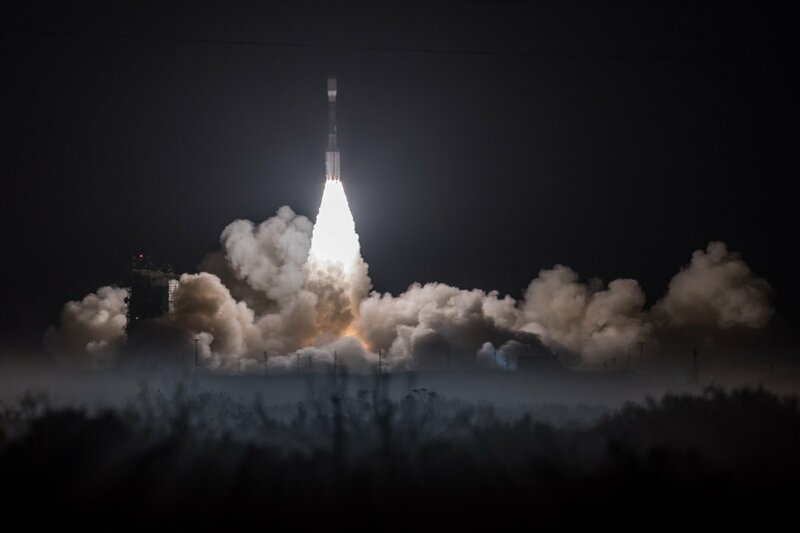 Saturday’s launch was the 53rd Delta II launch for NASA and the 723rd of a Thor-based launch vehicle finding its roots in the very beginnings of America’s space program. Delta II completed its final launch from Cape Canaveral in 2011 on the GRAIL mission to explore the Moon’s gravity and its final launches are dedicated to Earth science, requiring only the Vandenberg launch complex at SLC-2W to be kept in operation until the vehicle’s retirement. Saturday’s mission marked the final flight of the nine-booster Delta II variant known as 7920, hosting the Thor-XLT as first stage and a hypergolic-fueled Delta-K second stage with nine GEM-40s clustered around the core. 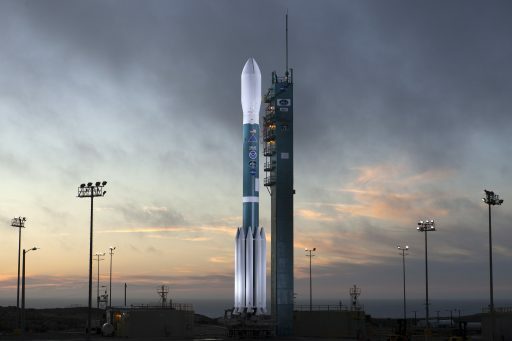 Standing 39 meters tall with a core diameter of 2.34 meters and a launch mass of 228 metric tons, Delta II can lift up to three metric tons into a Sun Synchronous Orbit. Hidden under Delta II’s three-meter payload fairing was the first satellite of the Joint Polar Satellite System, becoming America’s primary weather asset in polar orbit. 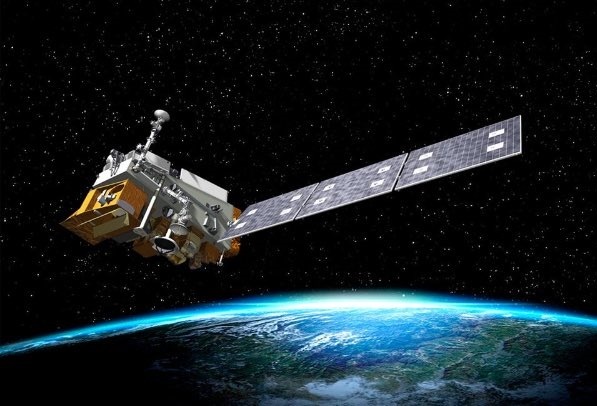 Operational meteorological satellite architectures typically employ satellites in Geostationary Orbits to capture high-revisit data to monitor weather systems while polar-orbiting satellites provide detailed atmospheric properties to be combined for weather forecast models. The Joint Polar Satellite System (JPSS) was born out of the National Polar-Orbiting Operational Environmental Satellite System (NPOESS) initiated in the 1990s in an effort to consolidate the civilian weather program operated by NOAA/NASA and the military’s Defense Meteorological Satellite Program. However, the tri-agency effort ended in a fiasco with budget overruns by a factor of two and years of delays as collaboration between three government agencies with different objectives and long-standing acquisition techniques proved impossible. 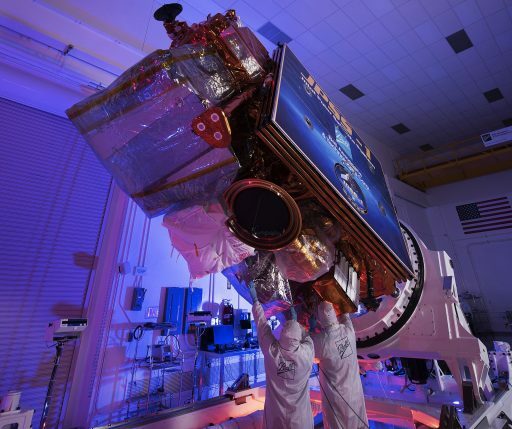 The programs were again split up in 2010 with NOAA and NASA proceeding into the JPSS Program to provide continuation for weather data collection in an afternoon orbit while the morning orbit will be covered through international cooperation with Europe’s MetOp program. Suomi NPP, originally intended as a pathfinder for the NPOESS program, launched in 2011 as a demonstration mission and as gapfiller to continue NOAA’s operational record begun in the 1970s with the most recent satellite, NOAA-19, launching in 2009. Standing 4.2 meters tall, the JPSS-1 satellite was built by Ball Aerospace as a close copy of the Suomi NPP spacecraft with strategic improvements on the craft’s thrusters, internal data transmission system and communications system that now includes the ability of sending data back through NASA’s Tracking and Data Relay Satellite System in addition to a series of ground stations. 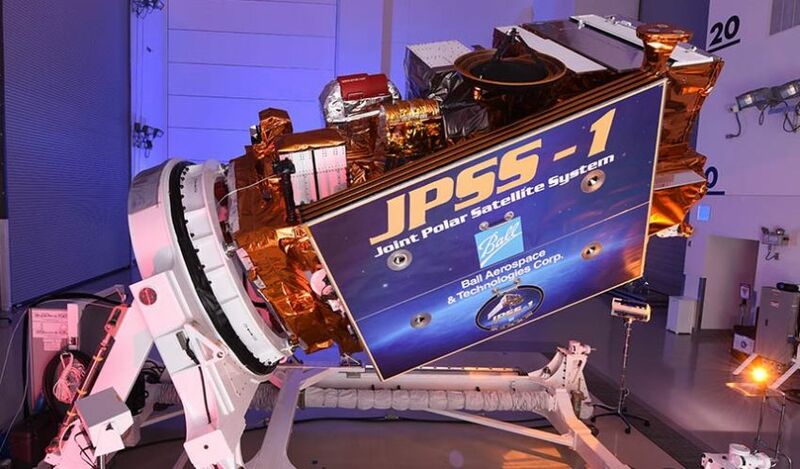 JPSS-1 employs Ball’s BCP-2000 satellite platform and hosts five instruments developed by a number of contractors, covering typical meteorological sensors like visible and infrared imaging equipment, a microwave sounder to extract atmospheric profiles and an infrared spectrometer for refinement of profiling data and atmospheric constituent data. 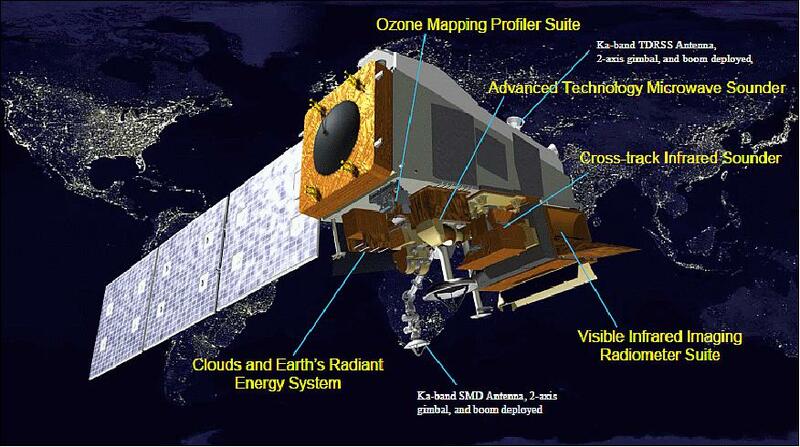 Additionally, JPSS hosts specialized instruments to measure ozone, of interest in operational UV index forecasting and of great importance to the scientific community looking at ozone hole recovery, and JPSS hosts a dedicated instrument measuring Earth’s Energy Budget – identified as one of the most critical climate variables. The primary imaging instrument of JPSS-1 is the Visible Infrared Radiometer Suite (VIIRS), a scanning instrument covering a broad ground swath of 3,040 Kilometers in 22 spectral channels to create color imagery to monitor cloud patterns, infrared data is applied to surface and ocean temperature measurements and cloud property assessments, and a special day-and-night band delivers cloud imaging in virtually all lighting conditions. The primary atmospheric profilers on JPSS are the Advanced Technology Microwave Sounder (ATMS) – a 22-channel microwave radiometer – and the Cross-Track Infrared Sounder – a 1,305-channel Fourier-transform infrared spectrometer, delivering temperature and humidity profiles from ground level into the upper troposphere to provide information on atmospheric disturbances and constituent concentration. 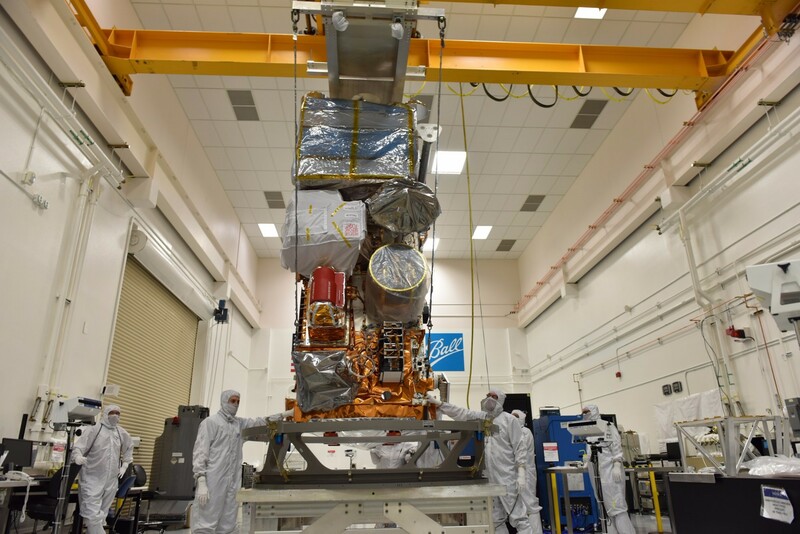 JPSS-1 is the first of four planned JPSS spacecraft to guarantee access to weather data through the 2020s and into the first half of the 2030s with each satellite expected to operate for seven years and sufficient overlap between missions for cross calibration. To be re-named NOAA-20 once in operation, JPSS-1 will be placed opposite Suomi NPP to optimize the two-satellite system for revisit rate to get the most out of NPP’s remaining years of operation. 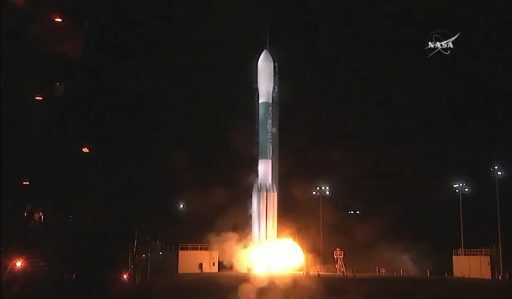 Delta II had to remain on the ground after launch scrubs on Tuesday and Wednesday, the first due to a technical issue and fouled range followed by a 24-hour turnaround that eventually ended when upper level winds intensified beyond allowable limits for the Delta II rocket. Teams had to stand down Thursday and Friday as winds aloft were forecast to remain strong. Countdown operations again went in motion Friday afternoon with the retraction of the Mobile Service Tower, enabling teams to close out the launch pad by removing access platforms around the base of the rocket before evacuating the complex, at which point the RIFCA, Delta’s primary flight control assembly was powered up for checkouts and reconfigurations. Over the course of a 20-minute sequence, Delta II’s first stage received nearly thirty metric tons of Rocket Propellant 1, followed by loading 67 metric tons of -183°C Liquid Oxygen inside L-2 hours. 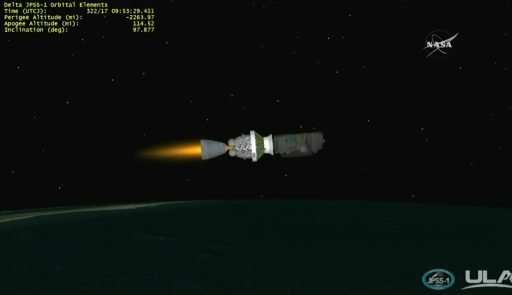 Standing fully fueled, Delta II went through pressurization checks and gimbal checks on all engines confirmed the vehicle would have good thrust vector control on its way into orbit. Weather was no issue through the night and all operations proceeded smoothly as Delta received its updated flight software and JPSS-1 switched to internal power for its climb to orbit. 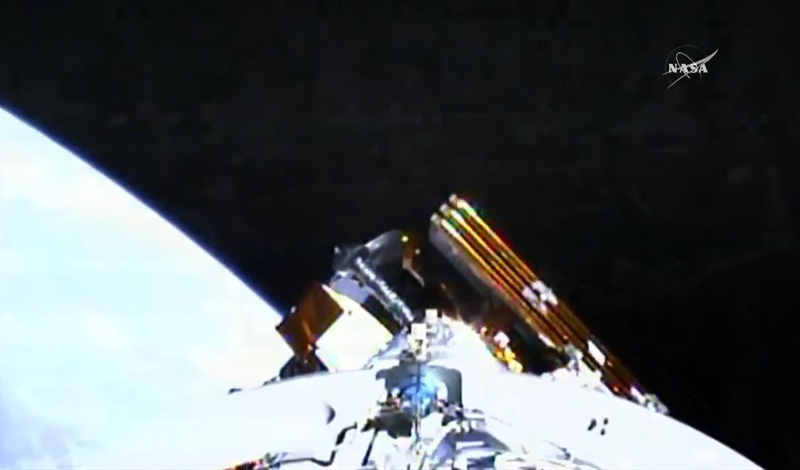 T-0 was re-aligned for the middle of the day’s brief 66-second launch window to position the satellite in the optimal slot relative to Suomi NPP. A unanimous GO for launch was given by all Stations when polled during the T-4-minute hold, allowing the countdown to proceed into its automated sequence. Delta II was commanded to switch to battery power and all onboard ordnances were armed before final pressurization started at T-3 minutes on the first stage fuel tank and T-2 minutes for Liquid Oxygen. Final verifications of hydraulic pressures occurred at T-90 seconds and the Western Range reported clearance for launch before Delta’s flight computer assumed control at T-1 minute, heading towards the hands-off point for launch controllers at T-10 seconds. Delta 378 came to life at T-3 seconds when the RS-27A main engine was fired up to soar to a launch thrust of 91 metric-ton-force along with its two LR-101 sustainer engines to assist in attitude control and add another metric ton of thrust. 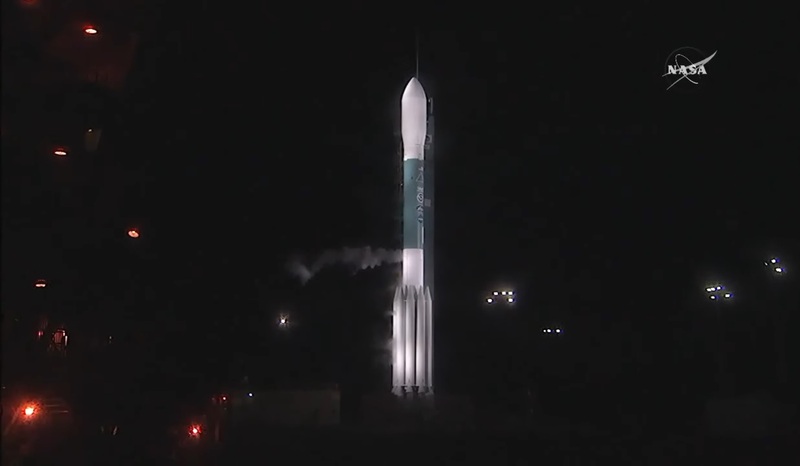 Clocks hit zero at 9:47:36 UTC and Delta II lit six of its nine Solid Rocket Motors to leap off the pad with a peak thrust of 480 metric-ton-force. Lighting up the night over Vandenberg, Delta II did not hang around and was off in a hurry – climbing vertically for less than ten seconds before initiating its pitch maneuver to depart to the south-west heading for a 98.7-degree orbit. The vehicle passed the speed of sound 33 seconds after launch and pressures on the boosters began to plateau as the vehicle made its way through Maximum Dynamic Pressure 47 seconds into flight. The six ground-lit boosters exhausted their 11,800-Kilogram propellant load after 63 seconds of firing time and burnout of the ground-lits prompted Delta II to fire up the remaining three GEM-40s, continuing toward orbit with a thrust of 304 metric-ton-force. Delta II held the spent ground lit boosters until T+1 minute and 26 seconds when the 11-meter long SRMs were jettisoned in two groups, ensuring a safe off-shore impact. The three air-lits dropped away from the ascending rocket two minutes and 11 seconds after launch at which point Delta II weighed less than half of what it did at liftoff. With all boosters cleanly separating, Delta II continued blazing towards orbit relying on its first stage alone, creating a vacuum thrust of 107,500 Kilogram-force as it burned 365 Kilograms of propellant per second. MECO – Main Engine Cutoff was called out four minutes and 23 seconds into the flight when the first stage shut down the RS-27A engine with the twin sustainer engines continuing to burn another four seconds for an attitude stabilization before shutting down as well. The 26-meter long first stage departed the stack four minutes and 31 seconds after launch, handing off to the Delta-K for the final boost to orbit. Six seconds after staging, Delta-K fired up its 4,350-Kilogram-force AJ-10-118K engine burning a self-igniting mixture of six metric tons of Aerozine-50 fuel and Nitrogen Tetroxide oxidizer. 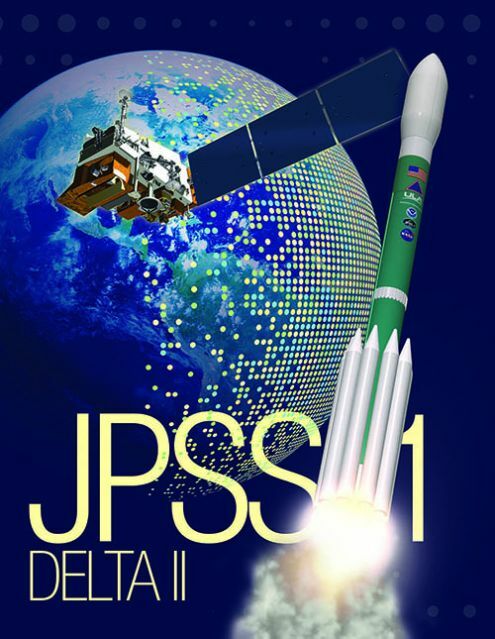 Just five seconds into operation of the second stage, Delta II split open and jettisoned its two 8.5-meter long fairing halves after crossing 150 Kilometers in altitude where aerodynamic forces were no-longer a threat to the satellite. The initial boost by the Delta-K was by far the longest of its four burns on Saturday, firing for just over six minutes to inject the stack into an elliptical Parking Orbit. Shutdown was confirmed ten and a half minutes after liftoff and Delta’s onboard navigation system showed an orbit of 185 by 865 Kilometers as the vehicle headed into a coast phase of 40 minutes to climb to the peak of the preliminary orbit. AJ-10 re-started 50 minutes and 50 seconds after launch and fired for just 24 seconds to circularize the orbit at 830 Kilometers in altitude with measured orbital parameters lining up very well as Delta’s navigation system showed injection at 816 by 828 Kilometers, 98.72°. Arriving in its target orbit, Delta-K used its thrusters to re-orient for the separation of the JPSS-1 satellite 57 minutes and 30 seconds after blastoff, sailing off on a mission of at least seven years to continue the collection of world-class weather forecasting data and climate parameters. 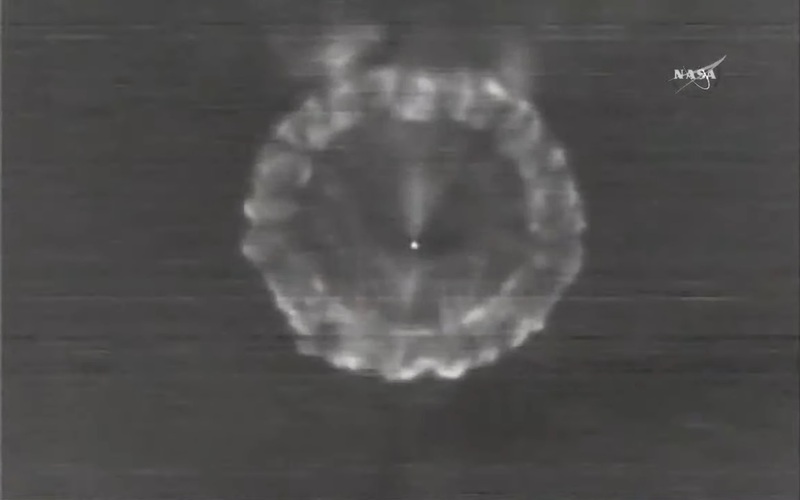 Separation of the primary payload did not mark the end for the Delta-K stage that had five CubeSats riding shotgun with JPSS-1, separating after a 10.2-second orbit-lowering maneuver performed right at the T+75-minute mark to adjust the orbit to 450 x 812 Kilometers, 97.7°. Packed in three deployers were two three-unit and three one-unit CubeSats four of which were flying under NASA’s Educational Launch of Nanosatellites (ELaNa) program. 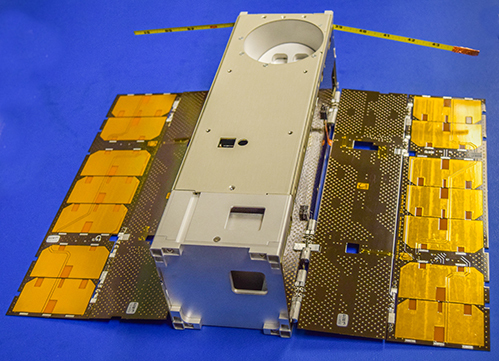 MiRaTa, the Microwave Radiometer Technology Acceleration Satellite, is a technology demonstration of NASA and MIT, using a miniaturized microwave radiometer and GPS occultation instrument to demonstrate a potentially ground-breaking onboard calibration technique for future weather satellites. The Buccaneer Risk Reduction Mission is being flown in a joint initiative of the University of New South Wales and the Australian Defence Ministry, geared toward demonstrating the deployment of a spaceborne high-frequency antenna in preparation for the operational Buccaneer mission that will be used to calibrate the Jindalee over-the-horizon radar. The three 1U CubeSats flying on Delta II are RadFxSat from Vanderbilt University looking into radiation effects on electronics, Embry-Riddle’s Eagle Sat that also studies the effect of radiation on memory in space, and MakerSat 0 – demonstrating a different paradigm of CubeSat assembly and launch that would allow for several science payloads to be integrated into a modular 1U platform on demand, including space-based assembly on the International Space Station before deployment. After sending the CubeSats on their way, the Delta-K stage was set for a 41-second deorbit burn one hour and 51 minutes into the flight to place it on a sub-orbital arc for destructive re-entry and splashdown of surviving components two hours and 11 minutes after liftoff.